That a plane should crash carrying Poland’s elite to Katyń – the key site of Polish martyrdom at the hands of Stalin – seems too grotesquely symbolic to be credible. 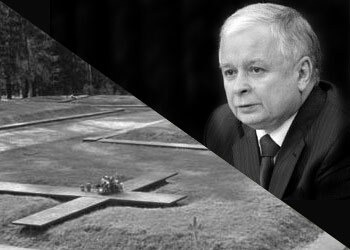 Lech Kaczyński had spent much of his life fighting the Soviet system, first as a member of Solidarity (he was imprisoned in 1981 during the height of the martial law era), and later as president of Poland, when he championed the controversial campaign of lustracja (lustration) that sought to sweep former communists from high offices throughout the country. It is 70 years since 22,000 members of the Polish elite were murdered at Stalin’s orders, about a fifth of whom perished in the Katyń Forest, near Smolensk. Last week’s commemorative ceremonies seemed to be a step forward in Polish-Russian relations. Putin faced the world’s cameras and addressed Soviet culpability for the crime – a crime which many Russians still ascribed to the Nazis, echoing wartime propaganda. The concentration of elite figures on Saturday’s flight makes the tragedy especially hard to swallow. All but one of the top seven military commanders were present, as well as the head of the National Security Bureau, the president of the National Bank, the president of the Institute of National Remembrance, the president of the Polish Bar Council – the list comprises some 88 dignitaries. Even the 90-year-old Ryszard Kaczorowski, last president of the government-in-exile that had stayed in London in 1945 after the Red Army extended its grip over Poland, was amongst the victims. Given that several key military personnel crashed in similar circumstances two years ago, the disaster has sparked angry diatribes about the wisdom of flying so many figures on one aircraft. Lech Kaczyński himself was due to stand down as head of state following the presidential elections planned for this autumn. In truth, much of the public had been tiring of him as leader. His hounding of former communists rankled with the left, and many felt that he was inclined to bouts of pettiness and bloody-mindedness that did not befit the presidential office. But this weekend’s tragedy has reminded Poles of his fundamental patriotism. His wife, Maria, a dignified and unassuming figure, also died on the flight, leaving a daughter. The president’s twin brother, Jarosław, who had previously served as prime minister and who was his sibling’s closest confidante, has flown to Smolensk to identify the bodies. Since Saturday morning, Poland has been united in tribute to the victims. The outpourings of grief echo the scenes that followed the death of Pope John Paul II, when seas of coloured lanterns illuminated Polish streets. The name of Katyń will now endure with a double resonance. As it was, last week’s ceremonies had signaled a welcome openness on behalf of Putin. It can only be hoped that a more thorough self-analysis of Russia’s past will follow, and that the legacy of Stalin’s purges and gulags returns to the forum of public debate. For now, Poland is in shock. National mourning has been declared, and Speaker of the House Bronisław Komorowski has assumed the role of head of state, as the Polish constitution dictates. He had already been tipped as a future candidate for the presidency. Now, by law, the elections must take place within 74 days, in June. Tragically, numerous state institutions will have to find new leaders.